What Makes The Cozy Such a Great Plane to Own and Fly? Find Out What Makes The Cozy Such a Great Plane to Own and Fly. The Cozy is a great family plane to have, it can carry four people plus baggage with a range of 1000 miles. One of the things I love most about this plane is the great view one has in a plane with a canopy. Not to mention how warm they keep you when flying on those cold winter days. They have great glide ratios and will not stall, so anyone can fly one with full confidence and ease. They are not cramped to set in, and allow you to have a comfortable and relaxing flight. 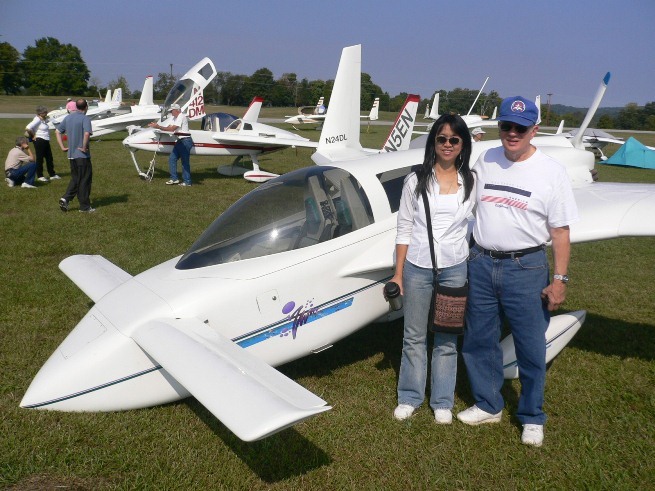 My Father Lou and My Wife Wannee Standing Beside a Cozy at The Rough River Fly-In, in Kentucky. The Mark IV Cozy has a very spacious Cockpit with full side by side dual controls. Wrist action control sticks are mounted on both side consoles for easy manipulation while flying. 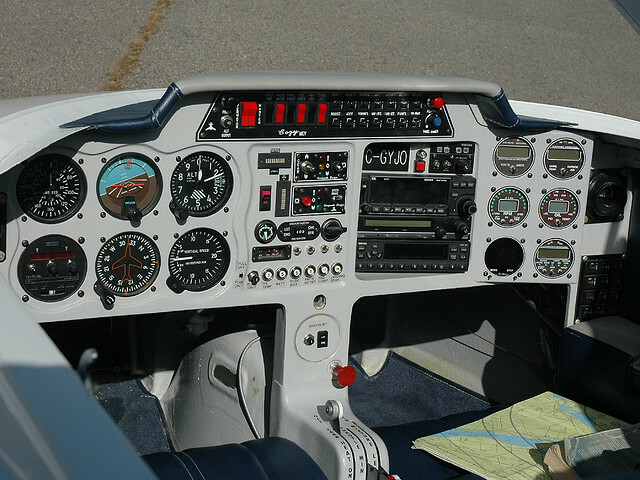 The instrument panel can accommodate quite an assortment of instruments, gauges and radio equipment. The back seat can accommodate two people and baggage as long as the combined weight does not exceed 300 lbs. Reclined seating provides maximum comfort for both the pilot and passengers. The flying characteristics of the Mark IV are superb with responsive ailerons, excellent hands-off stability, and stall properties. It will resist stalling or spinning even when you force full aft stick. So even the most inexperienced of pilots can fly it with no concerns about safty. When climbing out, the Mark IV climbs great even at full rear stick deflection. When coming in for a landing the approach speed is 80 knots and the landing speed of 65 knots. The landings are very straight forward and conventional with great forward and side to side visibility. This is a very well laid out dash in a Cozy Composite. Your flying range will depend on both speed and the amount of fuel you are carrying. If you are flying at a fast cruise of 75% power at 8,000 ft you will do about 218 mph with a fuel burn of about 11 gph. With full tanks you would have a range of around 925 miles. If you flew at economy cruise of 12,000 ft and about 170 mph. You would burn about 5.8 gph and have a range of 1350 miles on full tanks. At that speed it would take you about 7.9 hours with a 1 hour reserve. 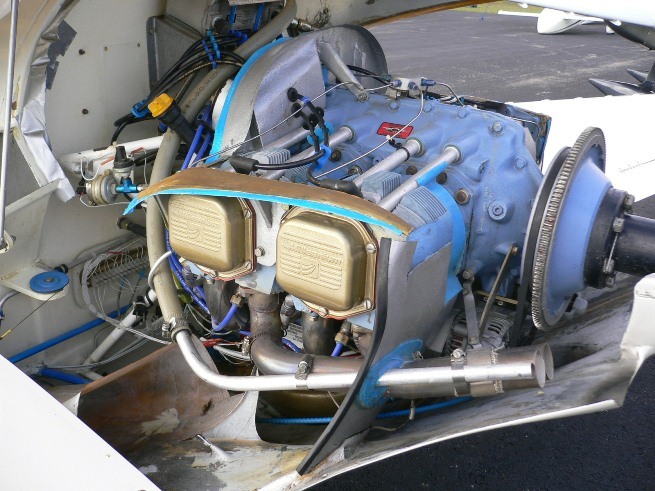 The Mark IV was designed to use 4 Cylinder Lycoming Engines of between 160 to 180 hp. This includes most of the model O-320, 340, and O-360. Another thing you want to remember is only the light weight fixed pitch wood propellers are approved for this plane. Modern wood props of today come with a plastic covered leading edge on them. This helps minimize rain erosion while flying, these props are nearly as efficient as the metal props. If you ever get the chance to fly in one of these beauties, you really will have the time of your life. As I've said so many times no matter what airplane you fly, they are all a pure pleasure. In the 35 years that I've been flying, I still love it as much as the very first flight I ever took. What a comfortable way to travel and have fun, you just can't beat it. Now get out there and do some flying, and have a ball!! Thanks for flying in to see whats new with "COZY", feel free to Bookmark this page and fly-by from time to time and see whats new. As always, stay safe and Happy Flying! !